The design of the Big Green Egg allows for perfect air flow to be able to control the temperature. The bottom vent allows you full control over the amount of air going into the Egg and through the coals. The variable “daisy wheel” on the top allows you a full range of options when controlling how much airflow goes through the chamber and escapes the Egg. All the while, the ceramic Egg is correctly radiating even heat on the grate surface where you put the food. Below, I’ve explained my system for temperature control at different levels for when we cook pizza, grill a steak, or smoke ribs or even cheese! What follows are general tips I have developed for regulating & controlling the Big Green Egg temperature. Learn How to Cold Smoke Cheese on the BGE – 6 lbs. of Cheese in Less Than 2 Hours! So how much charcoal should you use in the Egg? It depends on what you’re cooking! In my opinion, the Big Green Egg has three functions: 1) Grill / Cook, 2) Smoke, 3) Bake. I use different amounts of charcoal for each of the three functions. For Grilling and Baking, I fill the charcoal chamber to about 3/4 full to the line between the two pieces of the BGE. If I’m going to sear and grill a couple of steaks, I might put in a little more charcoal and get the Egg nice and hot. When I bake Papa Murphy’s pizza (Large Pizza works great! ), I put in a little less than 3/4 full because I don’t need as much. For smoking, it depends on the smoke and the length of the cook. If I’m going to be smoking a pork shoulder for 10+ hours, then I’ll be filling up the chamber. You will need to work on your temperature control because if you have too much lump and it gets too hot, then it’ll be hard to get the dome temperature (the temperature inside the dome at the top) down because the ceramic is now quite warm. Compared to a Weber Grill, or Weber Smokey Mountain, the Big Green Egg uses much, much less charcoal. 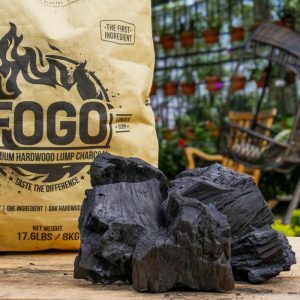 First off you use lump charcoal, and second, when you are done using the Egg, you close up the grill, and that seals things pretty well to snuff out the coals. By doing this, you can add a few pieces of charcoal to the chamber the next time you grill. Here are a couple of tips for lighting charcoal in the Big Green Egg. It’s essential that you need to know where in the chamber to light the charcoal. If you are going to be cooking at a high temperature (steaks, burgers, etc.) you want to burn the charcoal in the middle because you want the hottest part in the middle. If you are using the Egg as a smoker, I recommend just starting the coals in the back half. I like to use the Big Green Egg brand fire starters, and I put one of those in the middle of the charcoal, light it and keep the lid open for about 5 minutes. Once you can see that the charcoal has started to get a little orange fire in the firebox, then shut the lid. You will need to add the daisy wheel or Smokeware cap on top very soon, but you want to let the fire start to burn and heat the egg. I will usually let the grill continue as-is for another 5 minutes or so. You do want to balance the coals heating up with them getting too hot. This is a skill that you will eventually master but does take time. Remember, it is always easier to increase temperature than it is to reduce. Once the egg gets hot, it is nearly impossible to get the temperature down in a short period. Controlling the temperature is one of the most important things you do with the Green Egg. Here’s where things can get tricky but since the air flow through the Egg is fully customizable, you’ll figure out the right system that works for you. You don’t need a fancy automated temperature controller; you need to refine your technique with the tools you already own. I start with nothing on the top vent of the egg and the bottom vent wide open. We’ll control the temperature with the daisy wheel or the Smokeware stainless steel cap. I use the Smokeware cap because it gives me greater control over the heat. One of the things with the daisy wheel is that sometimes when you open the egg, you lose the settings, the wheel slide from time to time. Because you have the bottom vent wide open, you will want to make sure that the charcoal doesn’t get too hot before shutting the lid and putting on the daisy wheel or cap. It’s always easier to raise the temperature than it is to bring it down. Using the top vent to control the heat allows you the ability to refine and fine-tune the temperature much more easily. By the way, the best accessory I’ve ever purchased for my Egg is the Smokeware cap. I find temperature control is easier with the cap than the daisy wheel. Big Green Egg Tip: Here’s a tip for the daisy wheel, you probably know this already but in case you don’t, looking at the picture above, position the daisy wheel, so the raised letters (Big Green Egg) is at 12 o’clock. The bottom vent slider will stay put when you open the lid because it hits the raised letters of the writing. On my first cook, I didn’t see this, and the charcoal got hot and almost burned my steaks. Now from here, the Big Green Egg should keep a consistent temperature. If you need to adjust the temperature slightly (25 to 50 degrees) I usually use different combinations of the daisy wheel sliders. If the temperature is getting too high on you, then you can close the bottom door. It is just science, the more air you have flowing through the egg, the bigger the fire you’ll get. If I have one suggestion when using the Egg as a smoker, bring the heat up slowly. I had one smoke that ran about 350 degrees because I had gotten the Big Green Egg too hot. I recommend you get a laser thermometer — this helps to get the actual temperature of the grate over the plate setter. If you plan on cooking pizza on the Egg, I highly recommend getting a laser thermometer. You will need it to check the temperature of the middle of the pizza stone before putting the pizza on the grill. If the temperature is too low the center of the pizza will cook slower than the outside edges. That’s my system for lighting and controlling the Big Green Egg temperature for the three different functions. I hope you found this tutorial helpful and if you did, please share it! Let me know in the comments if you have a different system. Do you own a Weber grill? Check out my review of the Smokenator? Disclosure: If there is a product that I like and it has an affiliate program, then I might link to that product using an affiliate link. By using an affiliate link, it means that I might earn a commission on a product if you buy something through that link. It doesn’t cost you anything, but I just wanted you to be aware. type of info in such a perfect method of writing? I have a presentation subsequent week, and I’m on the search for such info. When I want to roast a turkey I can’t get the temp past 250. It is when I put the roasting plate in. I have to leave the daisy wheel off and the bottom slide wide open. Any suggestions? I am working on a lamb roast as we speak . I want to be at 375Degrees but I can’t seem to get above 300 Deg. Any tips ? My top lid / daisy will has the hole open about 50% and the bottom slider at 2″ open …. I don’t use the daisy wheel when I go o over 300 , I just use the bottom vent. If I am shooting for 350, I light the egg with the top open and the vent on the bottom is wide open. 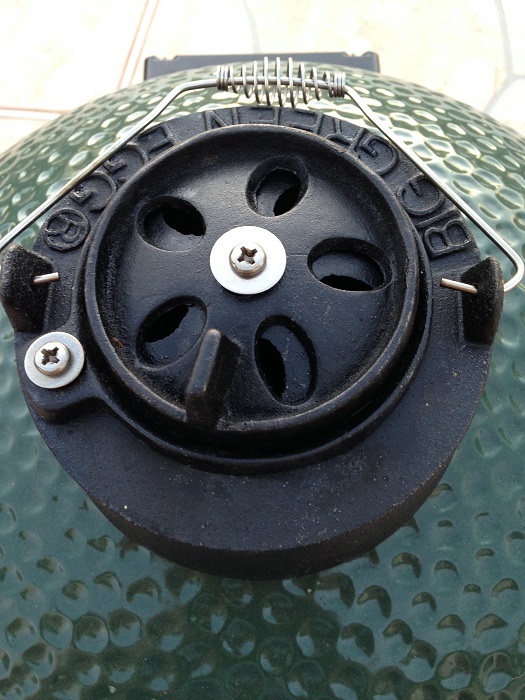 Once the the egg is at 300 I close the bottom vent to about 3/4″ to 1/2″. It usually takes about 20 minutes for it to stabilize. I only use the daisy wheel when going low & slow. The above does work, but I like not having to use both vents and seems to have simplify things for me. I left the first canister of coals in the canister too long and they died out, and temperature never got above 200, so I just dumped the rest of the small bag of coals in there and it’s been at 300 for almost an hour now. I hadn’t thought about having the daisy wheel to control the temperature. I can see how anyone looking for a way to control the temperature in one of this items would want to look at what you have said. I understand now that making sure you have the right combination of coals inside your big green egg as well as proper ventilation can help you reach the temperature you need. Thank you for sharing. first try smoking some ribs. fire nearly went out, opened the lid for a bit now I can’t seem to get it back down to 250. more like 375 at the moment. My guess – too many coals, too much air, wasn’t stabilized sufficiently at the onset of cooking. Thanks for that. I got a medium egg for Christmas, which I’m thrilled with but a little intimidated by. Your tips help give me the confidence to fire her up and not make basic mistakes. Can you recommend how much coal/procedure for cooking low and slow, 100 degrees for 6-7 hours, I’m cooking beef short ribs in a cast iron casserole, and I have medium egg. I also have an extra large egg (two diff locations). We need to lower the temp and I’m struggling. The information you posted has really given me some great ideas, thank you. For those that having problems getting the temperature up, I think you have an issue with obstructed airflow. Remove all the unused charcoal from inside the grill and make sure that none of the air holes a blocked. Take out the Firebox grate to get better axes two of the ashes fall and empty them out completely. When you put your charcoal in put the big pieces on the bottom and in smaller pieces of the top of them and then drop the little pieces and top of those. When you light the fire, lighted in three places, like a triangle and the place is of the points of the triangle. This should help you get a good fire going that was stabilized quickly. Enjoyed your sharing of your experiences on BGE. I am cheap, instead of using BGE fire starters or electric starters , I drizzle about a tablespoon of olive oil on 2 sheets of paper towels or paper napkins. Let them absorb oil for a couple of minutes . Place them in opposite sides in charcoal and light. Be sure to place a couple pieces of lump on paper.